There is a simple DOCX document with TOC containg two Chapters and SubChapters. For example: We need to modify or add some text inside of these Chapters. First of all, load a DOCX file, which need to update TOC. You can automatically update it if you make changes in your document. TOC can be updated only after all document content is added. The paginator is used to divide a document into discrete pages. You can change default character formatting for all text inside TOC. Save our document as DOCX. // Save the document as new DOCX file. 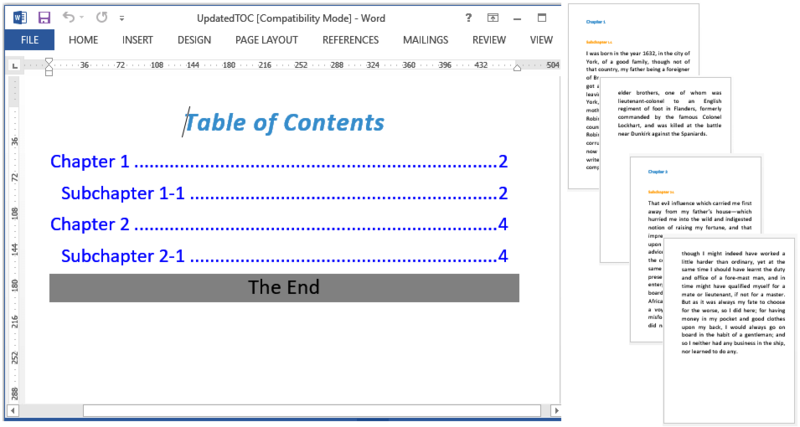 /// Update table of contents in word document. // Load a .docx document with TOC. // Insert the paragraph as 6th element in the 1st section. // Insert the paragraph as 10th element in the 1st section.
''' 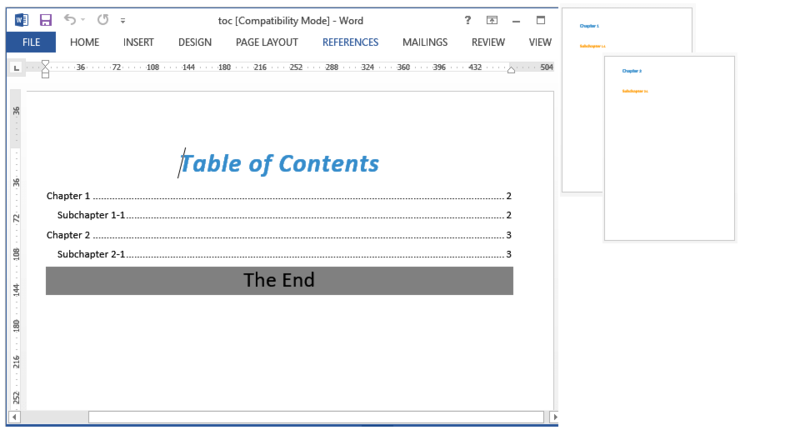 Update table of contents in word document. Dim pathFile As String = "..\toc.docx"
Dim resultFile As String = "UpdatedTOC.docx"
' Load a .docx document with TOC.
' Insert the paragraph as 6th element in the 1st section.
' Insert the paragraph as 10th element in the 1st section.
' Save the document as new DOCX file.